A special train organised for represntatives of the local authorities along the line, 23 June 2009. Photo BTWT. I was up bright and early the following morning for my trip on the Przeworsk Railway on the 09:00 to Dynow. Pan Zelazny sold me my ticket at the narrow gauge station. All workings on this line nowadays are diesel-hauled. 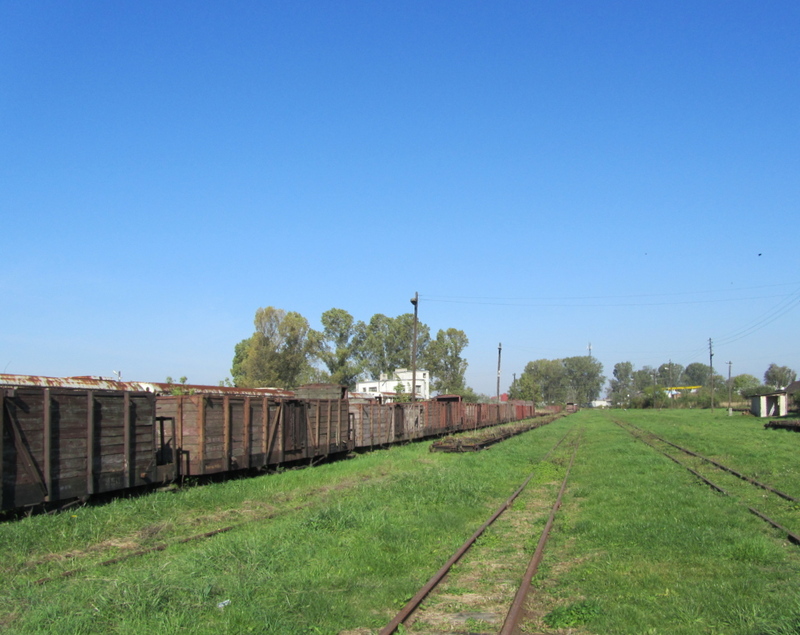 Lxd2-268 headed the tourist train, consisting of: four 1980s-Romanian-built railcar trailers; two semi-opens, converted from freight vehicles; and a guard’s / utility van. The gratifyingly well-filled train made a punctual departure. The first part of the journey was across low-lying flat ground, though with pleasant rolling country to the side, and high hills tantalisingly ahead. Sharp bends, though, were a feature of the route right from the start. The most exciting scenery started some 35 kilometres out from Przeworsk on the 7 kilometre section between the tunnel (the only one on the Polish narrow gauge) and the penultimate station of Bachorz. To allow photographers to make the most of the scenery, there was a photo-stop at the tunnel’s southern end. After some hard climbing, and and some wild loops and twists the last 4 kilometres run into Dynow was level, though the line ran between high and splendid hills. The line has been described as Poland’s answer to the Darjeeling Railway. Photo BTWT. Lxd2-257 runs round its special at Dynow, 23 June 2009. Photo BTWT. 14:30 saw the departure of the reunited whole train from Dynow, back ‘down the hill’. I had travelled up, in a semi-open coach, but with rain having set in, relocated myself to a Romanian closed vehicle for the journey back. An equally pleasant journey ensued, with the punters clearly enjoying the whole experience – there does seem to be a definite and appreciative local market for these tourist trains. As something of a railway purist, in theory I can feel this kind of scene to be downright ghastly; but in the case of the Przeworsk Railway I am more than willing to suspend my purism. The tourist trains are excellent fun, and their continuation for many years yet, is much to be hoped for. At first sight, 46 km in two-and-three-quarter hours can seem ludicrously slow – a speed of roughly 17 km per hour. The basic fact is, though, that 750mm gauge trains do not travel very fast. In genuine-passenger-service days, a train between Przeworsk and Dynow took the same amount of time, as a 2010 tourist working. By the often-noticed ‘magic of the narrow gauge, with the vehicles being only a small distance above the ground, the rate of progress does not seem to be unduly slow. A very agreeable experience, in any case – who would want it to be over with in the blink of an eye? The train arrived punctually at Przeworsk at 17:10, in nice time for the my 17:50 departure for Krakow, en route for another 750mm tourist line to be sampled on the morrow. Holding sidings close to the s.g./n.g. ramp at Przeworsk. There’s a wonderful overnight train plying between Poland’s north-westernmost corner at Swinoujscie (a hot contender for the country’s most unspellable and unpronounceable place name for foreigners), and its rival in these categories, at the opposite south-easternmost corner of the country, Przemysl. This train calls at Poznan, and at Przeworsk. At the former I wished to board it, and at the latter, to disembark. The train includes sleeping cars, however when Dyspozytor attempted to make a reservation by phone he was unable to get through to PKP InterCity’s telephone booking service. So, when I reached Poznan Glowny station, I made a bee-line to the PKP IC customer service office, only to be told that as the train had already left Szczecin it was now too late to make a sleeping berth reservation! I understand that sleeping berth upgrades are available from the attendant that travels with each sleeping coach. But being a rather timid character and with virtually no command of Polish, I settled for a still-vacant second-class seat on the crowded train when it arrived at Poznan Glowny at 23:10 on July 22nd. After a fairly forgettable night and an early morning, I reached Przeworsk around 10:30, some half an hour late, on Friday the 23rd. The 46-km Przeworsk – Dynow 750mm gauge line is generally reckoned Poland’s best narrow-gauge section for scenery, save for the Bieszczady preserved forestry line still further to the south-east. Its current status is a little unusual. It is worked by SKPL, but is geographically far away from that firm’s Kalisz headquarters – a situation which has at times raised problems. Officially the line is open for freight traffic, of which a little does run at rare and unpredictable intervals; but most of the action nowadays takes the form of a one train-each-way-per-day tourist service which runs on summer Saturdays and Sundays. It is likely that SKPL will, after this year, give up the unequal struggle concerning this line, and relinquish its operating agreement. [SKPL sent a formal notice, resigning from their operating agreement, to the Chief Executive of the Przeworsk District Council earlier this week. D.] The local authorities in this area appear much more supportive of their narrow gauge railway than is usual in Poland, and there would seem to be a fair possibility of their taking it over and continuing the tourist workings, in years to come; but the line’s future is far from certain, and it seemed a good idea to take the chance to travel on it this summer. I had briefly visited Przeworsk before, in 1984, but that trip had been focused on standard-gauge steam, with no time or attention available for the 750mm line. On this year’s visit, I noted a standard gauge locomotive plinthed at Przeworsk station – Ol49-8 – a representative of the class most prominent hereabouts a quarter-century ago. With the tourist train’s departure time being 09:00 – difficult to fit in with a same-morning arrival from the west – plan was to spend Friday night in Przeworsk. The place seems to be more significant as a railway centre, than as a civilian settlement; and lies some way away southward, from its stations – accommodation for rail-borne visitors, therefore a potential problem. Dyspozytor thus enlisted the local knowledge of the n/g line’s general manager, Pan Wladyslaw Zelazny. On my presenting self to him on arrival on Friday morning, he kindly drove me to the Hotel Zgoda, only a few minutes away by car; I was duly installed there, and we parted ways till the following morning. The Zgoda, whilst undoubtedly a Godsend for rail travellers to these parts, was an experience. Had some of the traits of a nostalgia-trip back to Communist times, inadvertently I’m sure on the part of those who run it. Though the staff were pleasant and helpful, the general facilities were at best so-so. Shared bathrooms and toilets – no effete en suite arrangements here. In the showers, at least one shower-head proved to be totally detached from its fitment. The rooms were fairly Spartan. There were no towels provided, and the lighting was abysmally dim. An evening meal could be had, but the only sitting was at 18:00 hours which clashed with my planned expedition, so no use for me. Admittedly, the accommodation was commensurately cheap: 36 zloty (£9) per night for a single room. I occupied Friday afternoon with a standard-gauge bash: a dose of nostalgia for something from steam days which I had read about, but never experienced. Until late in the steam era – 1989 or ’90 – the branch north-eastward off the main line here, to Belzec, was solidly steam on passenger, worked by Ol49 from Przeworsk depot. (Until the mid-to-late eighties, further steam from another division of PKP, made its appearance at Belzec.) My short 1984 visit had not involved this line: focus had been on the more dramatic steam route into Przeworsk from the north-west. 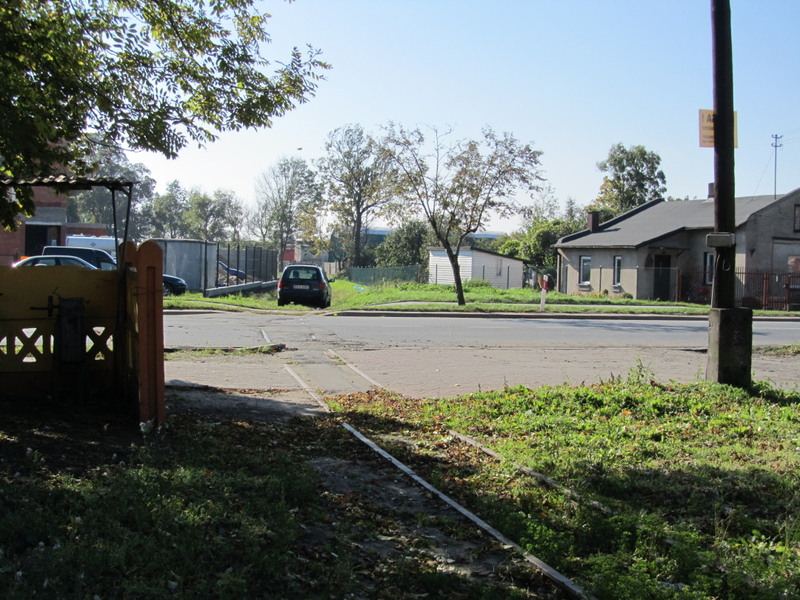 Of this former 97km branch, 58km at present retains a passenger service, from the main-line junction as far as Horyniec Zdroj – a basic four workings each way per day, one of which nicely suited my movements. I journeyed by main-line train to Jaroslaw, 15km to the east of Przeworsk. Here I took a break for lunch, the station being conveniently right in town centre. I then continued on the 15:28 departure down the branch. Once again, the train was a modern railmotor, SA109-010, an articulated double-unit, branded as running in the colours of Podkarpackie province. The workings were quite well patronised on the outward and the return run. Scenically, it was frankly a boring journey. This part of south-east Poland is virtually dead flat, though delectable hill country begins not far to the south. Unless the terrain changes dramatically beyond Horyniec Zdroj, this must have been a rather dull steam route, lacking in gradients and thus noise-and-smoke effects. There was a delay at Munina, the actual junction point – awaiting a westbound main-line connection – which put the working behind time. The timetabled three-minute turn-round at Horyniec Zdroj was accomplished at lightning speed, giving me no opportunity to check out the status of the track on the passenger workings-less section on towards Belzec. It was the same picture as on standard-gauge branches elsewhere – seemingly no freight action, all intermediate goods yards overgrown and out of use. This trip was, however, as much in homage to how things had been on this line a couple of decades back, as for its own sake. The return working, departing Horyniec Zdroj at 16:47 as per the timetable, gave me a through run to Przeworsk, and then proceeded further along the main line to Rzeszow. And so after, a fairly effortless journey back, I returned to the rather penitential regime of the Zgoda. The SKD when trains still ran to Wielichowo. Video by vicinalasvi. At Poznan Glowny station, I found the same problem as recounted by Dyspozytor in his post, Customer Care Conundrum – the displayed timetables at the station did not seem to have heard of my train, supposedly scheduled to reach Stare Bojanowo at 15:42. Unlike Dyspozytor, I had the good fortune to have plenty of time at my disposal and I asked at a likely-looking Informacja window, where the chap on duty knew a little English, and was able to tell me the time and departure platform of my train. Stare Bojanowo was reached on time. I was met there by Dyspozytor and two of Smigiel line’s general manager’s daughters – one to take us around the railway; the other to drive the car. In fact the whole family looked after us splendidly throughout the whole action-packed 24 hours or so at Smigiel. 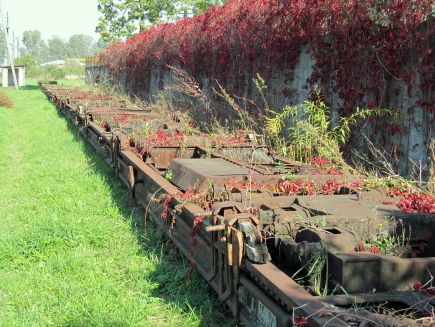 The visit started with being taken round the overgrown and bordering-on-ruinous transporter wagon loading facility at Stare Bojanowo. I saw some forlorn-looking transporter trucks and learnt that they were last used in March this year. In view of later developments, the future of freight working on this line seems uncertain. Dyspozytor was keen that I should meet up not only with the line’s management, but also with a representative of the line’s owner, Smigiel Town Council. A meeting with the mayor was duly arranged. Wth Dyspozytor acting as interpreter I tried to explain to the Mayor that a purely tourist operation is in many enthusiasts’ eyes, considerably less attractive than a real railway fulfilling a real passenger and / or freight commercial function. But the mayor was having none of it. His plan for the future of the line has already been covered on BTWT. The general impression that I received was that the best that can be hoped for, is for some of the line to survive as a purely tourist operation. The dealings of Polish local government authorities nowadays, with narrow-gauge railways in their remit, seem on the whole to be characterised by a strong anti-railway mindset, and in that connection, mind-boggling spite and stupidity. It is to be hoped that such local authorities will eventually realise that a preserved narrow-gauge line is a wonderful tourist magnet and thus provides a big boost to the local economy and that, having done so, they will not actively seeking to thwart its doings and confiscate money from its coffers. After the railcar trailer painting working party mentioned in the same BTWT post, I caught a mid-afternoon Wolsztyn Experience special run in one of the line’s Romanian-built diesel railcars. At Stary Bojanowo, I changed trains – I was bound for Poznan and an overnight run to the south-east of the country. At least I can say that I have twice done the 5 km Smigiel – Stare Bojanowo secion, that direction only, by MBxd2 : in 1993 and now in 2010. It would seem that Smigiel – Wielichowo will never be mine; but, as an old proverb tells us, You can’t win them all. A local EMU took me to Poznan, from where I was to depart for the south-east, my target being there being the narrow-gauge Przeworsk Railway. I arrived at Poznan Glowny a little before departure of the 17:22 steam working to Wolsztyn – Pt47-65 on two single-decker coaches. Feeling that I have done justice to the Wolsztyn scene on previous trips to Poland, I had made no plans to look in there, on this tour. The 17:22’s departure was to be my only sight during the whole tour, of a steam loco in steam and in motion. Znin 0-8-0T with ‘home-made’ tender. Photo Zninska Kolej Powiatowa archive. The Znin line, operates what is by Polish narrow-gauge standards an intensive seven days a week summer service, though nowadays it runs in isolation from the rest of the country’s rail passenger network. Znin has to be reached by bus. Services, some of quite reasonable frequency, operate to and from various railheads. So, using the next available local EMUs from Krzyz to Poznan, and then Poznan to Gniezno, I was able to catch the 15:30 Gniezno – Znin bus. As the Znin line had not been on my agenda I did not have a copy of its timetable. Instead I trusted to luck and my awareness that in Polish n.g. terms, the line operated a ‘London-Underground’ style service frequency. Luck did not oblige: alighting at the 600mm line’s outer terminus, Gasawa, right on the bus route, I discovered that the day’s final train had departed some half an hour previously. From Monday to Friday, the line operates a busy schedule, requiring two train sets, but it starts late and finishes early. On a Saturday or Sunday, I would have been in time for the last inbound train, but this was a Tuesday. I decided, that ‘when rail fails, feet must serve’, and set out to walk the 12 km length of the preserved line to Znin. This line has been on the preservation scene for a very long time – some 35 years – and I had travelled on it before, in 1983. Many memories were prompted by the walk, which in the event took me an unanticipated three hours. I am clearly not as fit as I might be. In 1983, the line – nowadays exclusively diesel-worked – was using an 0-8-0 tender-tank, Tx4-564, a delightful machine, to haul its tourist trains. This preservation undertaking is on an excellent wicket, serving as it does in its short compass, various tourists attractions. These include: the 600mm gauge railway museum at Wenecja; the meticulously-restored Iron Age settlement at Biskupin with, at a discreet distance, hard by the railway’s Biskupin halt, various tourist-bait – an ‘iron Age hut’ kebab joint, a ditto gift shop… (none of this was around in 1983); and Gasawa village is a beauty spot, with a nice church. The Znin railway used to be a compact, but-complex, 600mm system, with numerous branches. Genuine passenger services were withdrawn as long ago as 1963, but freight traffic kept the line busy long after. For some reason best known to itself, PKP decided in the 1970s to make Znin, its 600mm preserved railway (at that time it still had 600mm gauge lines elsewhere with genuine passenger services), and initiated the Znin – Gasawa ‘museum trains’. In 1983, most of the system was still in use for freight – chiefly diesel-worked, though the PKP guide on the organised tour with which I visited the line, claimed that steam was still used for freight on a couple of its branches. The guide was a delightful fellow – an impassioned gricer and steam-freak to the extent that one sometimes suspected that he lived on another planet… All that is now gone. There remains only the tourist line Znin – Gasawa, and a short disused length of what was once a branch running west from Znin (Gasawa line runs due south). First 600mm train of the day out of Znin, was at 09:00. In theory, I could probably have had a token ride to the first halt, 2 km out, and walked back from there; but was still footsore from the previous evening, and had mundane things to see to before leaving town. Standard motive power on this line now seems to be class Lyd2 0-6-0 diesel locos – two seen at the station, ready for action – the timetable requires two train sets. Lyd2-57 took out the 0900, a few minutes late: one authentic 1950s bogie coach, plus half a dozen semi-opens created for tourists. Necessary tasks done, a refreshing beer, and then off on the 10:25 express bus to Poznan via Gniezno ex Elblag. I reached Poznan just after midday. Miedzyrzecz Station before WW II. 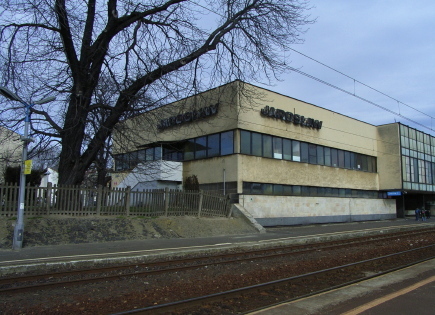 Miedzyrzecz Station today. Photo Maciej G, Kolejowy Wroclaw. The depressing condition of secondary standard-gauge passenger lines earlier in the tour, had lessened my enthusiasm for exploring them (Rzepin – Miedzyrzecz was a much-desired exception) so a change of plan was called for, I would visit some interesting preserved lines, even though I had visited the lines concerned, on my earlier Polish trips. My initial idea was to head north to the Gryfice – Rewal – Pogorzelica metre-gauge preserved railway, which runs every day of the week in the summer season. The gricing gods proved to have other ideas, as I was to experience in the ensuing hours. Miedzyrzecz’s somewhat basic bus station, essentially the railway station forecourt, seemed at first sight almost as desolate as its rail counterpart, and not inspirie me with great confidence. I began to doubt whether the purported 08:50 Gorzow replacement bus would actually show up. When just before 08:00, a bus – seemingly not heralded by any displayed list of departures – rolled in, I queried the driver as to its destination. When he replied, Gorzow, I got on board and found myself at that town’s rail station, not quite an hour later. Düwag 6ZGTW tram on ul. Sikorskiego, Gorzow Wielkopolski, April 2005. From a photo by Macdriver, pl.Wikipedia. Gorzow, a medium-to-large-sized town, and not a usual destination for conventional tourists, has a modest standard-gauge tram system, which most properly has an offshoot to the station, with a balloon loop right in front of the building. Unfortunately, I had no chance to ride on the trams, my priorities were to take the first chance to grab some breakfast, and to see to my onward travel arrangements to the seaside and its metre gauge. At first, it seemed that the unexpectedly early bus would allow departure for Krzyz, by a train two hours earlier than that envisaged. However, to rephrase the words of the Navy chap in World War I, There’s something wrong with our bloody trains today. Present-day rail travel around Poland is less easy than in former times, because of the continual state of flux in which passenger services seem to find themselves in nowadays. Often, what actually happens, is not reflected by the arrival-and-departure timetables posted up at stations – is sometimes, in fact, not shown on them at all. And, especially if one does not know the language – and is not helped by announcements over station loudspeakers – it is impossible to determine whether the differences from the displayed which occur are official long-term changes of train timings, or simply quirks of the day’s operation. Thus – for whatever reason – instead of the expected 09:47 departure from Gorzow, I found myself on a train, working in from further west, which left at 10:24. This service, running over the unelectrified west-to-east line through Gorzow, was formed of diesel loco SU42-504 hauling three single-deck coaches. It was a nice change from the ultra-modern railmotors which seem to predominate nowadays on non-electric passenger lines. These vehicles, though they do their job perfectly adequately and give quite a comfortable ride, but with their space-ship looks, are visually most unappealing. An hour and a quarter’s all-stations run through undramatic but pleasant terrain, brought me to Krzyz, but a four-way junction today, a glorious seven-way junction in the 80s. Soon there were further indications that this was not going to be a good day for achieving what I had planned to do. Thinking myself highly clever in expediting my onward progress, I had bought at Gorzow, a ticket to Szczecin via Krzyz. The guard of the Gorzow – Krzyz train, alerted to my intentions while checking tickets, informed me volubly but incomprehensibly, that there were some problems ahead. Polish word-of-mouth having failed, he kindly sought me out subsequently, and by dint of his few words of English, sign language, and his copy of the timetable book, conveyed to me that because of some mishap, services on the Poznan – Szczecin main line north-west of Krzyz were disrupted, and a replacement bus service was operating over part of the route. With Poland’s rail passenger workings, things do not on the whole happen very quickly. My snap judgement was that the delays likely to be involved would reduce my chances of making the connection further north, which would be vital to getting some action on the metre gauge that day. A rendezvous with friends and allies at Stare Bojanowo (the railhead for Smigiel) was already scheduled for 15:42 the following day. With my not having that appliance owned by almost every inhabitant of modern Poland – a mobile phone – attempts at making contact to alter arrangements, were a potential nightmare, to be reserved for acute emergencies; grices going wrong, were basically not in that bracket. I made an Instant decision to forget the visit to the metre gauge railway at Gryfice, and to substitute a preservation venue more in striking distance both of where I then was, and of the Smigiel area where I soon hoped to be. My new destination was to be the 600mm line at Znin. Disused platform at Rzepin station. Photo Roland Semik. I reached Rzepin a little before 16:00 hours on Mon. 19th July. Plinthed by the station was 2-10-0, Ty51-37. Appropriately – this class is strongly associated with this venue, in a ‘graven on the heart’ way. These big, powerful post-WW II Decapods were a class which always fascinated and attracted me, and with which I had little luck. By the time I first got to Poland in the 1980s, this class was in retreat – on the whole, heavy freight was an early priority for dieselisation by PKP. The locations where steam still handled such traffic, became few and far between. In the endless war between gricers and PKP, paranoia became a trait discernible on both sides. Some railfans were convinced that PKP, indulging their sadistic impulses, deliberately concentrated their dwindling numbers of active Ty51 locos in sensitive border areas where attempted photography, or even too obvious an interest taken, would land the enthusiast in deep mire. (The fact that pre-the 1990s, all Poland’s neighbouring countries were supposedly friendly Soviet-bloc allies, was neither here nor there.) This was the case at Rzepin. Up to beginning of the 80s, the Warsaw – Berlin main line’s electrification ended at Zbaszynek. For the 80-odd kilometres from there to the East German border at Kunowice / Frankfurt-Oder, most freight was hauled by Ty51s based at Rzepin. Early in the 80s, the wires were extended west from Zbaszynek to Rzepin, but for a few more years, the dozen or so kilometres from Rzepin to the border remained unelectrified, and the Ty51’s stayed in business bridging this short gap. I saw the magnificent machines on freight duties in this area, on entering and leaving Poland in 1980 and 1984; but was aware that breaking off my travels to take an interest in their so doing, would be an enterprise which I would likely have cause to regret deeply. Well, it is all over now – rest in peace, Ty51-37. Rzepin – not high on Poland’s must-do list of tourist attractions – was on my agenda because of one particular line. The one-time cluster of branch lines north of the east-west main line, all the way from Poznan to Rzepin, was one of Poland’s last areas to use steam on a regular basis – mostly in the form of class TKt48 2-8-2Ts, working from the Miedzyrzecz depot. I saw a little of this scene in the 80s; but never travelled on the 66 km line from Miedzyrzecz to Rzepin, which stayed TKt48-worked till 1990 or so, and retained diesel-hauled passenger services for some years after that. Quite astoundingly, in 2008 – probably ten years or more after passenger services were suspended – the Miedzyrzecz – Rzepin line was reopened to passengers under the auspices of the provincial government. I had always thought of the line as an archetypical useless-in-the-modern-age super-rural Polish branch line, of the kind on which passenger services were slaughtered by the scores and hundreds, in the early 1990s. Ever since I knew that – should I ever revisit Poland – this is one line that I must do, if by a miracle it would still be running when I got there. I did; it was; so a date was made with the 06:10 Rzepin – Miedzyrzecz on Tuesday 20th July. I had spent the previous night at Rzepin’s Park Hotel, within easy reach of the station – comfortable enough, and very inexpensive. Not many people beat a path to Rzepin. I was at the station in comfortable time for the 06:10. The revived passenger service on this line is very meagre – I had very little choice regarding workings. The day before, I had witnessed the 16:41 arrival from Miedzyrzecz. (There was no return working on that day.) This was formed by a modern railmotor, SA 105-104 – a four-wheel single-unit job, tiny as this range of vehicles go – branded as operating for Lubuskie province. The same railmotor worked the 06:10 on the 20th. The departure was punctual, and was followed by an hour and twenty minutes’ run through attractive, well-wooded countryside. Calls were made at nine intermediate stops. We left Rzepin with about ten passengers, and arrived at Miedzrzecz with twelve or thereabouts – a fairly high degree of passenger turnover en route. Once again the total lack of freight action, gave a melancholy tone to the scene – deserted, overgrown goods yards, and lineside factories once clearly rail-linked, but with the sidings to them now severed. Nevertheless it was a journey which I was highly pleased to get in the bag. Could I but have travelled on the line two or three decades earlier, behind a 2-8-2T and with the whole set-up busily functioning; but alas there was never enough time or money to do anything like the amount of Polish steam-bashing, that could have been accomplished. Works train passes through Poland’s only narrow gauge railway tunnel. 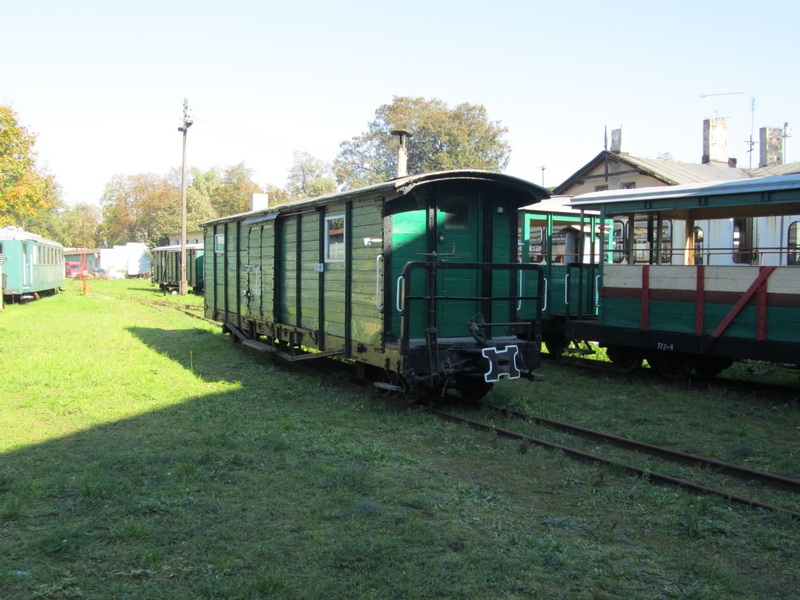 Citing mounting losses, SKPL – Poland’s last freight narrow gauge railway operator, has informed the Chief Executive of Przeworsk District Council that it intends to resign its agreement to operate the Przeworsk narrow gauge railway. Though tourists have long since replaced sugar beet as the line’s principal traffic the line still carries a vestigial freight traffic, making it one of Poland’s last three surviving freight carrying narrow gauge railways. Unfortunately, passenger and freight receipts are insufficient to cover all costs. Over the years, the local councils representing the communities along the line have clubbed together to hire special trains to boost the line’s takings, but the gap between income and expenditure has still remained significant. Local council leaders had hoped that the shortfall – some £22,000 – would be met by a grant from the regional government of Podkarpacie Province. So far Zygmunt Cholewinski, the Chief Executive of the regional government, has refused to counter any kind of financial support from regional government budget. In 2010, the line suffered from the torrential storms and subsequent flooding which affected many parts of Poland. In several places, embankments were undermined by rivers that had burst their banks – suffering similar damage to that which had closed the Corris Railway in 1948. Through the herculean efforts of General Manager, Wladyszlaw Zelazny and his small team. the breaches were patched and the line continued operating throughout the 2010 season. But now major repairs are long overdue and without additional funding a serious question mark must be raised over the operation of the line in 2011. Przeworsk Station, the end of the line. Photo by Grad. Engineers and miners celebrating the breakthrough. Photo BBC. At 14:17 CET today, Friday 15 October, ‘Sissi’, a massive tunnelling machine, broke through the last few meters of rock at the Gotthard Base Tunnel so creating the world’s longest tunnel. With a length of 35.4 miles (57 km), the tunnel is a tad under 2 miles longer than the previous record holder, the 33.5 mile long undersea Seikan tunnel, linking the islands of Honsiu i Hokkaido in Japan. The construction costs of some £8.5 billion are being funded by Swiss taxpayers, who are paying more than £800 each to fund the project. Voters approved the construction of the rail tunnel in a series of referendums nearly 20 years ago. In 1994, they also voted to limit the number of heavy goods trucks allowed to cross the Alps each year to 650,000 – halving the current load – within two years of the tunnel’s opening at the end of 2017. The project is part of the AlpTransit project, also known as the New Railway Link through the Alps, which also includes the Lötschberg Base Tunnel between the cantons of Bern and Valais. It will bypass the Gotthardbahn, a winding mountain route, which includes the 1881 Gottard Rail Tunnel, and will provide a much more direct route usable by high-speed rail and heavy freight trains. 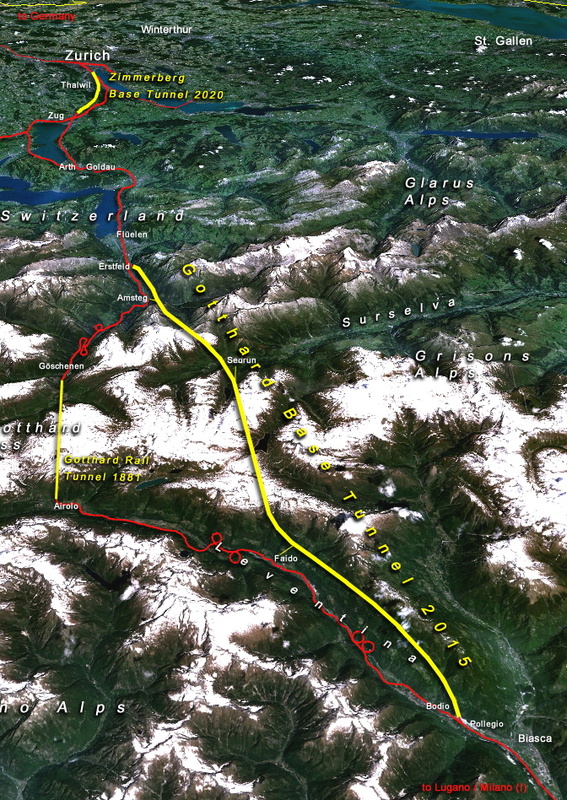 The New Railway Link through the Alps NRLA / Alptransit project in Switzerland with Gotthard and Zimmerberg base tunnels. Montage cooper.ch via Wikipedia. One of the pages of the new TLK portal page. Several hours after our post reporting the demise of the Tanie Lnie Kolejowe portal, the website magically reappeared. The new website looks very much like a ‘work in progress’. Clicking on any of the coloured tickets on the carousel leads to a ‘Page not found‘ landing page. 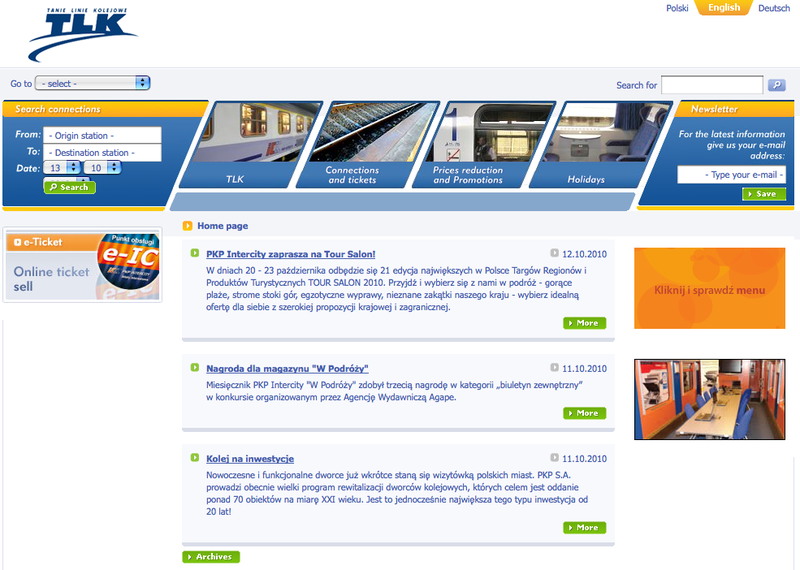 The item at the top of the latest news column announces that any passenger can send in comments regarding the latest PKP IC timetable with a deadline for submissions of 30 September. Perhaps someone on the bridge of the great ship PKP IC saw our last article and ordered the website reinstated ‘ready or not? Internet archive of the PKP IC TLK website. It is the rats who first know when a ship is doomed, their desperate scurrying ashore a sure sign that it is time to leave the ship. An it’s time for us to leave her. On 9 October, PKP IC’s Tanie Linie Kolejowe website, http://www.tlk.pl, vanished. There was no announcement, no page saying, You are being redirected to the main PKP IC website, nothing! The TLK website came on-line in Autumn 2005. It started off well – kolorowe bilety promotions, a manager’s blog… By 2007 there were 29 pages. But then the website started a decline and only 6 pages were maintained in 2010. With thanks to podroznik for today’s story. Volkswagen Transporter head to head with Volvo truck. 18 people travelling to work in a Volkswagen Transporter van lost their lives as the result of a head on collision between their vehicle and a Volvo articulated truck at 06:18 on Tuesday. The accident happened on the outskirts of Nowe Miasto nad Pilica on the 707 road leading to Rawa Mazowiecka. It appears that the driver of the Volkswagen was attempting to overtake a Scania ready-mix concrete lorry. It was dark and there was a thick fog. The driver of the Scania stopped to see what had happened and then drove away from the accident scene before the police arrived. The police and emergency services were summoned by the driver of the Volvo, who survived the accident. 16 people were killed outright, two others died in hospital. The Volkswagen Transporter van was variously reported as being fitted with 4 or 6 seats. It appears that the majority of the passengers – seasonal workers travelling to pick apples – were seated on wooden boxes or planks. Neither the driver nor his vehicle were licensed to carry fare paying passengers. 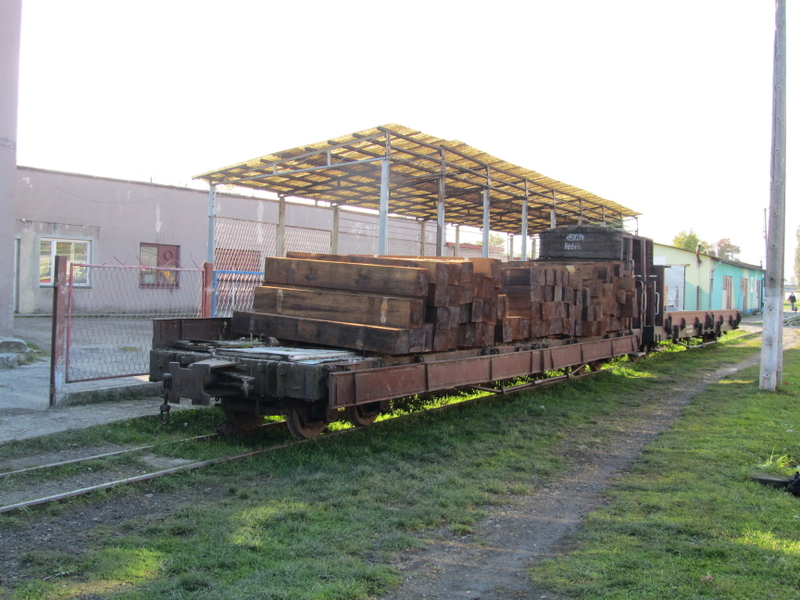 Flat wagon loaded with bridge timbers at Jedrzejow, 10 October 2010. I love narrow gauge freight operations and was delighted to find this flat wagon loaded with bridge timbers in the yard at Jedrzejow station. Part of the line runs on a long viaduct across a marsh. 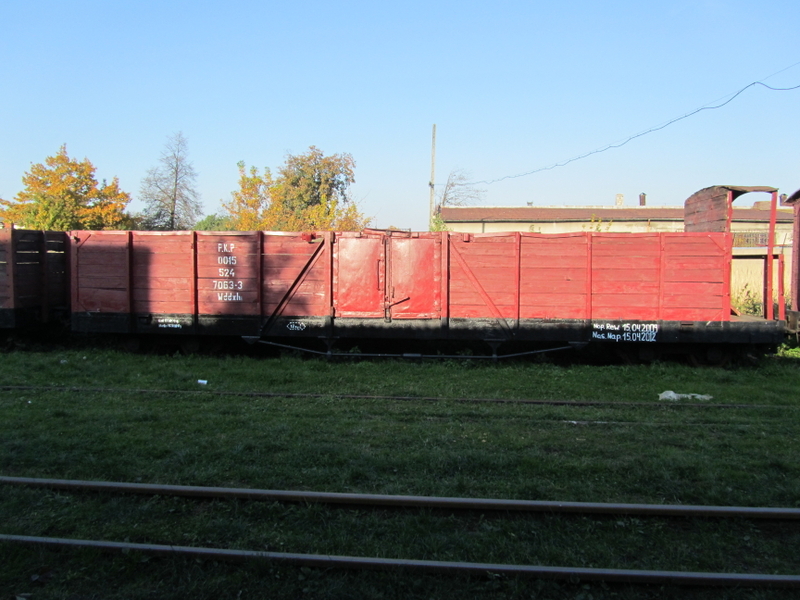 Open wagon at Jedrzejow, 10 October 2010. It has been a long time since this open wagon carried its last load of sugar beet, but it is still maintained in operating condition for photographic charters. Passenger stock at Jedrzejow, 10 October 2010. The passenger stock is maintained in tip-top condition. Unfortunately the Swietokrzyska Kolejka Dojazdowa like other Polish narrow gauge railways has no covered accommodation for its rolling stock. Px48-1724 in its shed Jedrzejow, 10 October 2010. Although this was my third or fourth trip to Jedrzejow Px48-1724 had always eluded me, so it was a pleasant surprise when I was approached by a member of the operating team and asked whether I wanted to see the railway’s steam locomotive. Px48-1724 was buit in 1950 and after serving on various Polish narrow gauge railways ended up in a scrap siding at Opalenica as a donor of spares for the line’s other steam locomotives. From here it was rescued by a team of railwaymen from Jedrzejow and restored to working order in 1993. Konrad Borowiecki at Jedrzejow, 10 October 2010. My guide turned out to be Konrad Borowiecki, one of the five men who keep the line running. Konrad’s service on the line dates back to PKP days. He spoke wistfully of the days when the line was part of a 716 km network and employed over 1,000 staff. He remembered how PKP planned to move the locomotive to Sroda Wielkopolska. Local residents joined railwaymen in organising a demonstration and the engine stayed at Jedrzejow. Konrad spoke bitterly about the lack of support the line was receiving from the various local authorities who own segments of the line. At Pinczow one of the most picturesque sections of line running into a forest had just been lifted. He also mentioned the lack of recognition given generally to Poland’s narrow gauge railways. He also lamented the fate of the erstwhile Piotrkow narrow gauge railway’s two Lzd2 diesel locomotives. 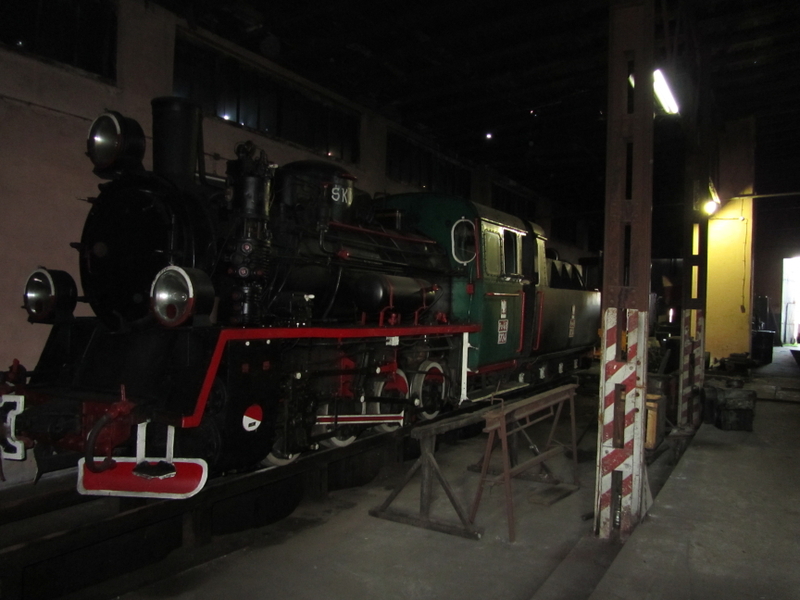 The engines – though missing radiators – had been kept in their shed at Piotrkow Trybunalski and were basically in working order. A few months ago they were sold for scrap. Sign requesting Hanoi residents not to build anything less than 5.6 metres from the outer edge of the rail. From a photo ©Florian Grupp. BTWT rarely strays East of Moscow, although there are occasions where the story is so extraordinary that we venture further afield. Florian Grupp has posted some amazing pictures of the railway line leading to the main line station in Hanoi. Is this the only place in the world where a railway leads a Jekyll and Hyde existence – main line railway one minute, busy alleyway the next? 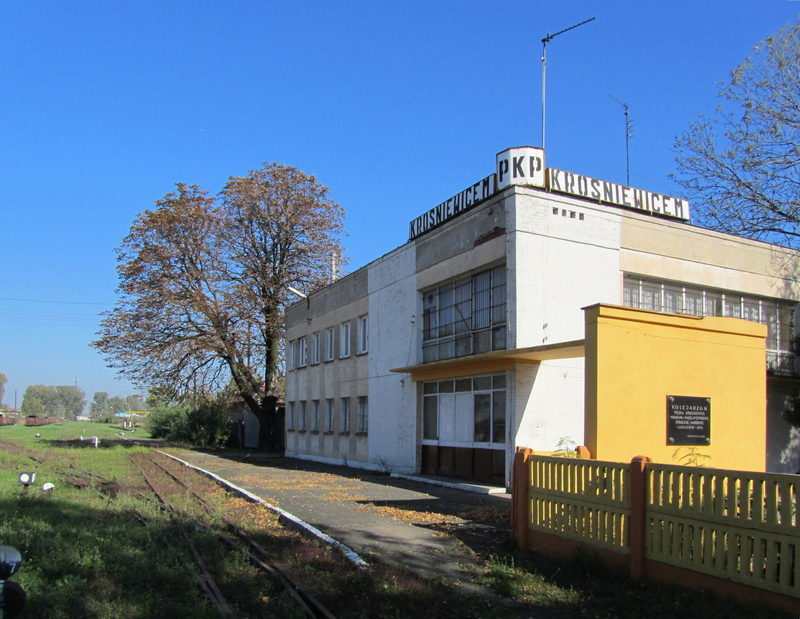 Once the nerve centre of operations, former Kujawy Railways HQ at Krosniewice on 5 October 2010. Note sign indicating that the station was once called Krosniewice Miasto. Photo BTWT. On Sunday I received a report of a fire at Krosniewice station, so on Monday I set out to check the damage. 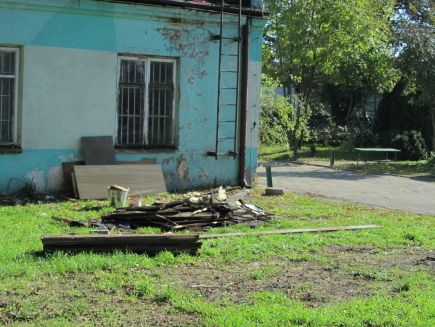 Fire damaged woodwork at former Kujawy Railway offices. Luckily the fire had been quickly contained. The damage was confined to part of the the building that, in SKPL days, had housed the General Manager’s office. The level crossing to the South of the station has been partly asphalted over. The main line provides a convenient parking spot. Photo BTWT. The state of the railway as a whole is a cause for great concern. Level crossings have had their flangeways asphalted over and the undergrowth is reclaiming the railway track. 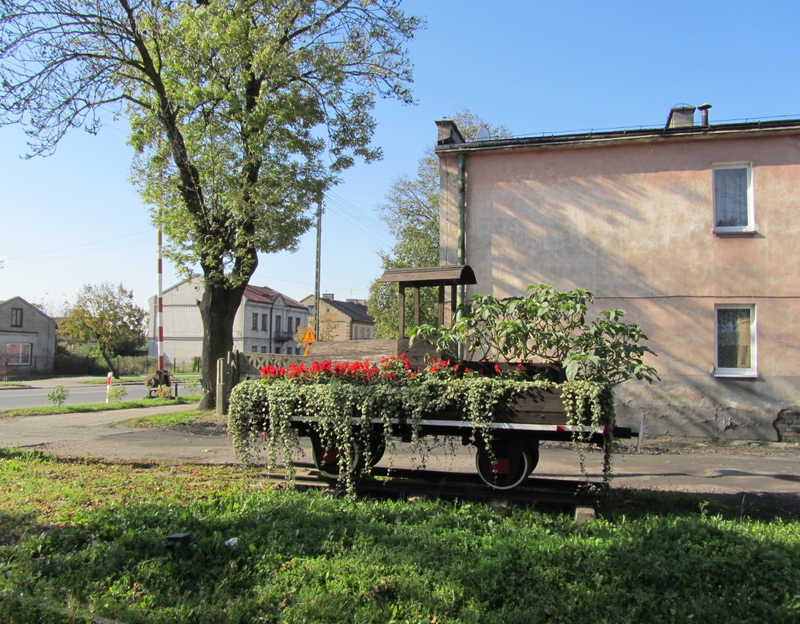 The Mayor of Krosniewice’s sole contribution to the development of the Krosniewice Railway – a flower arrangement utilising a former platelayers’ truck. Photo BTWT. In November this year, the Mayor of Krosniewice, Mrs Barbara Hermann, will be terminating her Council’s licence to manage the Krosniewice Railway. After PKP closed all its surviving narrow gauge railways in 2001, the Krosniewice section of the former Kujawy Railways was taken over by the Town Council and operated by SKPL till March 2008. Transporter wagons wait for the scrapman’s torch in a siding. Photo BTWT. In SKPL days, the Krosniewice Railway carried as much as 100,000 tonnes of freight each year. A contract for the railway to carry roadstone for the building of the A1 motorway was just being negotiated when Mrs Hermann terminated SKPL’s licence to operate the railway. Property development plans were the reason for the withdrawal of SKPL’s licence. Mrs Hermann asked SKPL to radically reduce the footprint of their opeartions at Krosniewice, and in particular, to relinquish the repair shop and machine shop. When SKPL refused, Mrs Hermann’s terminatied their operating agreement. 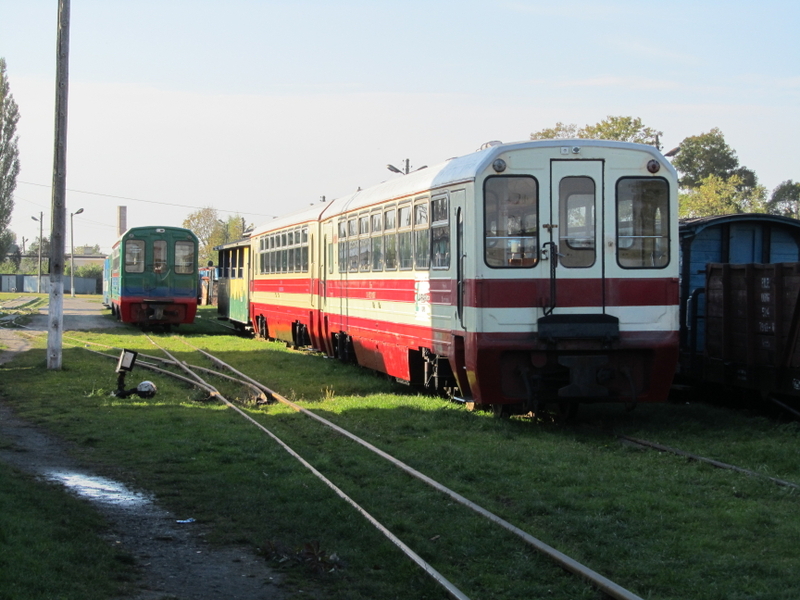 Passenger rolling stock outside the repair shop in Krosniewice. Photo BTWT. After SKPL’s licence was terminated the Mayor of Krosniewice allowed just a couple of special trains to run. Local volunteers repainted the rolling stock and cleared some undergrowth. There have been no operations during 2010. Special train on the Kalisz narrow gauge railway on 2 October 2010. Photo Kajetan Orlinski. Saturday’s special train on the Kalisz narrow gauge railway gives me an excuse to review and link to some interesting Polish websites that I thought BTWT readers might enjoy. For those of you who are not fluent in Polish and who have not yet discovered the delights of Google Translate here is some magic which will turn Polish websites into websites with reasonable English. Simply cut or copy the URL (web address) at the end of each paragraph. Now go to Google Translate. You will find a link at the top of our Blogroll in the column to the right of this article and another at the very bottom of this post. Next paste the URL into the box provided and set Google Translate to translate from Polish to English, and Bob’s your uncle! The narrow gauge section is a delight, while the Galeria contains one of the neatest photos of the special. An Orbis travel bureau. From a photo on the Studio Reklamy Mars website. Orbis Travel, Poland’s biggest travel agency in Poland has gone bust. Orbis was founded in Lwow in 1920 by 6 entrepreneurs from Lwow. In 1933, it was nationalised when PKO, a state-owned bank, bought out a controlling packet of shares. By 1939, it had become the dominant travel and hotel business in Poland, with 136 branches, 5 hotels, and 5 million customers. The company was revived after WWII by Poland’s communist government. In the 1950s and 60s, it had a near monopoly in arranging foreign travel for Polish residents and arranging visits to Poland for visitors from abroad. By 1980, Orbis had become a giant – the company owned: 60% of all hotel beds in Poland, including the prestigious Hotel Forum and Hotel Victoria in Warsaw; 555 coaches; and 373 cars. Each year it looked after the needs of 1.5 million foreign visitors and had a customer base of over 12 million. In 1991, Orbis became Orbis SA. a limited company, and in 1983, its transport and travel agency businesses were split out into two subsidiaries: Orbis Transport and Orbis Travel. In 1997, Orbis SA’s shares debuted on the Warsaw stock exchange. In 1999, the packet of shares owned by Poland’s state treasury fell, below 50%. In 2000, the French international hotel and travel group, Accor SA, acquired a controlling interest in Orbis SA, so completing the privatisation of Orbis. In January 2010, Orbis SA, sold its loss-making travel agency subsidiary Orbis Travel, for 1 zloty to to the private equity and venture capital company, Enterprise Investors Sp z oo It is being reported that Accor SA had concentrated on restructuring Orbis’s hotel business and that the travel agency subsidiary, operating on as ‘business as before’ basis, was piling up huge losses. Whatever the truth of the matter, 2010 proved to be a disastrous year for Poland’s travel industry. The global financial meltdown, the shutdown of Europe’s airspace following the eruption of Eyjafjallajokull and the gloom felt in Poland following the Smolensk plane crash, all dealt a heavy blow to an industry that was facing heavy competition from the ‘build your own package holiday’ offerings of the low-cost air carriers. Two weeks before the demise of Orbis Travel, the Polish travel agency Selectours had also filed for bankruptcy. After reviewing the holiday season’s results at the end of September, Enterprise Investors decided to pull the plug on Orbis Travel. On 28 September, Orbis filed for bankrupcty in the Warsaw District Court and on 29 September, after several hundred Orbis customers flew out on their holidays, Orbis travel announced that it had ceased trading and that it would not be in a position to pay for flights and hotel accomm0dation that it had sold to customers. Over a thousand Orbis customers were abroad when the announcement was made, the Mazowian Provincial Government is arranging their flights home financed by Signal Iduna, with which Orbis Travel had taken out a 6 million PLN insurance policy. After Orbis Travel announced its bankruptcy several interesting aspects of the story were aired in the Polish press. Orbis SA announced that they had been prepared to help Orbis SA through its cash flow problems – subject to the condition that Enterprise Investors provided a similar financial facility – but had been rebuffed. Enterprise Investors responded by accusing Orbis SA of hiding the true state of Orbis Travel at the time that the sale was agreed. Meanwhile Marcin Nowak, writing in Dziennik Zachodny, questions the logic of Enterprise Investments acquisition, perhaps Orbis Travel would have been better off it it has been acquired by Rainbow Tours who had also expressed an interest in acquiring the company. Orbis SA, have announced that they are withdrawing the licence to use the Orbis name and brand from Orbis Travel. It seems therefore that, after 90 years, this could be the end of Poland’s most famous travel brand.